Map of the Five Cities of New York, Brooklyn, Jersey City, Hoboken & Hudson City. 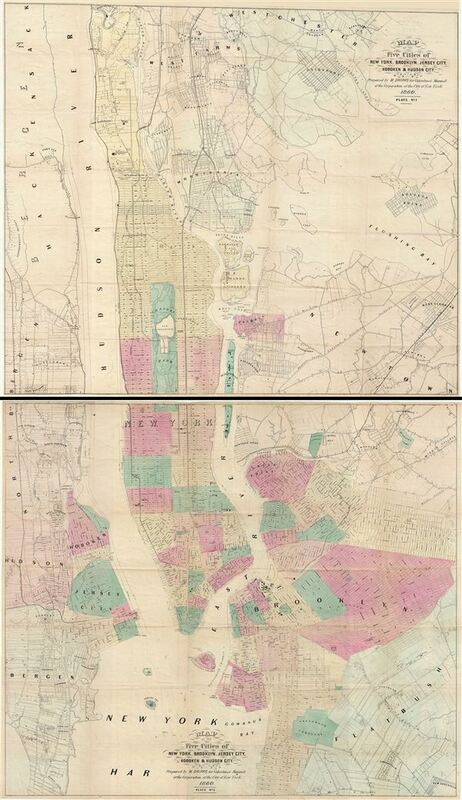 This is an uncommon example of Matthew Dripps' two panel 1860 map of New York, Brooklyn, Jersey City, and Hoboken. Issued as a set of two maps (plate 1 and 2), with plate 1 covering from Westchester to 63nd street in Manhattan and from Bergen to College Point. Plate 2 covers from 62nd street in Manhattan to Flatbush in Brooklyn. The region is shown in considerable detail and identifies street numbers, railroad lines, important buildings, parks, ferry lines, reservoirs, and various other details. A great source for understanding what Manhattan, Brooklyn and Jersey City/Hoboken looked like in the middle 19th century. Roosevelt Island is here identified as Blackwells Island, while Liberty Island is Bedloe's Island. Where Columbia University now stands, this map reveals a 19th century Lunatic Asylum. Fort Washington and Fort Lee are both identified. This map was prepared by Matthew Dripps for inclusion in the 1860 edition of D. T. Valentine's Manual. Matthew Dripps (1812 – April 9, 1896) was an Irish-born American mapmaker active in Philadelphia and New York during the second half of the 19th century. Dripps was born in Gracefield, Ireland. In Ireland, probably Belfast, he worked as a grocer. Dripps immigrated to American from Belfast on the Patrick Henry in 1849, arriving in Philadelphia, where he connected with the Reformed Presbyterian Church and worked briefly as a tax collector. His earliest recorded maps, depicting Philadelphia, appeared during this period. Dripps relocated to Brooklyn, New York in 1850, setting up shop as a map publisher. His two largest maps were published in the following years, 1850 and 1851, and combine to form an enormous map of Manhattan. These gained him the attention of the City Council, who used his maps for census and government work. Afterwards, he issued other large format New York City and Brooklyn maps as well as smaller maps for the New York City Clerk's office. He was married to Ameila Millar Dripps with whom he had six children, among them Amelia Dripps and the clergyman Joseph Frederick. Dripps is interred at Greewood Cemetery, Brooklyn. Valentine, D. T., Valentine's Manual of the Corporation of the City of New York, (New York) 1860. Very good. Set of two maps. Original fold lines visible. Minor wear on original folds. Professionally flattened and backed with archival tissue.